Lauren Kelley '21 sets the ball for Cathrine Ray '22. On Friday, Aug. 24, the JV White volleyball team took on the St. Stephen’s Spartans with a home crowd advantage, and won with a score of 2-0. During the first set of the game, Lauren Kelley ‘21 aced six points in a row, and while she was serving for the team, they earned a total of 14 points. The girls played hard and won the set with a final score of 25-5. The beginning of the second set started off neck-to-neck, but the Lady Warriors were committed and pulled far ahead into the lead by 10 points. They continued to fight hard and ultimately were up the whole time, and won the last set with a final score of 25-6. A tradition throughout the game, and throughout the season, is to say “Ayyyy” every time the team earns points. Even though the Lady Warriors won, Gray reminded her teammates to cheer every time they got a point to build team spirit and to build their sportsmanship for future games. 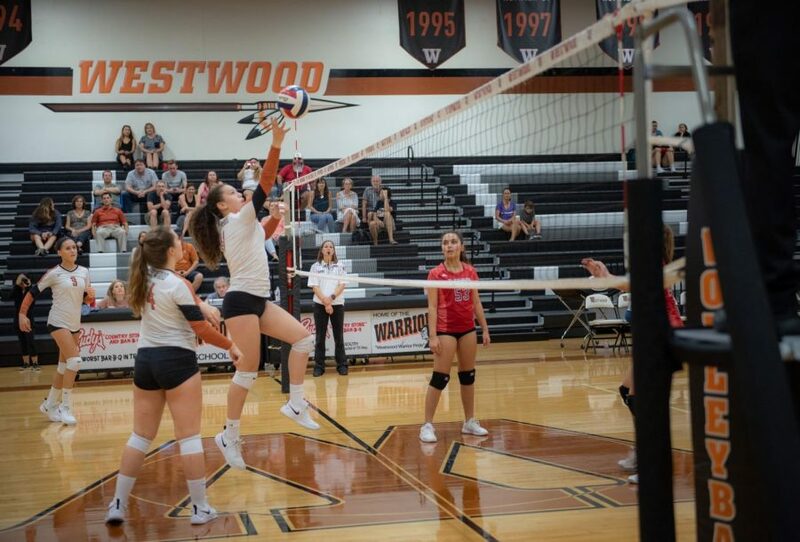 The Lady Warriors face off against the Round Rock Dragons on Aug. 28 at 5:30 p.m. at Round Rock High School.